(Hong Kong – 3 October 2017) As a lighting system expert, MEGAMAN® smart lighting solution allows users enjoy a new level of home automation in terms of convenience, energy saving and security. Always getting smarter and adding new features, the brand new INGENIUM® ZB Smart Lighting Solution now works with Amazon Alexa voice commands. You can simply use the mobile device or even easier – Alexa to control all smart devices of your connected home or commercial spaces. The INGENIUM® ZB Smart Lighting Solution enables automated control and scene-setting of smart devices via mobile device, making different settings to be programmed according to the time schedule of a day. Control commands are transmitted via ZigBee® equipped gateway to the Internet. The advanced functionality of Alexa voice commands enable you simply tell your lights to turn on/off, dim and activate the scenes without using the mobile app. The extensive product range of the INGENIUM® ZB Smart Lighting Solution includes Gateway, LED Classic, LED Candle and TECOH® THx LED Light Engine, Dimming Modules, Mains Switching Modules, Remote Controllers, Energy Measuring Smart Socket Adaptors and Assorted Sensors. You can gain wireless control of INGENIUM® ZB enabled LED bulbs and other smart devices from anywhere, individually or in groups, all from the app or Alexa voice commands. It works with its very own INGENIUM® ZB gateway or other popular ZigBee® equipped super-gateways. The INGENIUM® ZB Smart Lighting Solution also allows for the connection of 150 devices by utilizing ZigBee® 3.0 technology. Designed for control of conventional LED light bulbs and luminaires, the INGENIUM® ZB Dimming Module offers 150W and 250W versions, in particular, can be attached to MEGAMAN® Dimmable LEDs and you can enjoy instant smart home control and seamless dimming. The Mains Switching Module is also available for ON/OFF lighting. When the INGENIUM® ZB mobile app is not in use, the Remote Controllers with handheld and wall-mounted options are another great way to control the devices. 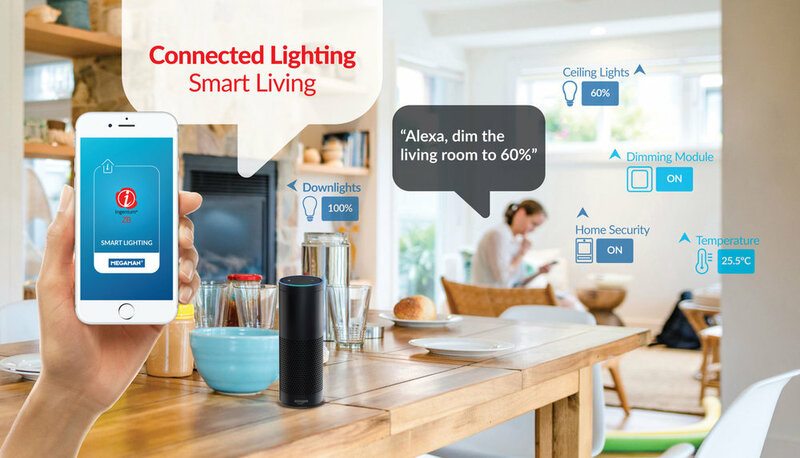 With Smart Socket Adaptor and multi-purpose Sensors, you can even build a connected home or office with home appliances, like table lamp, heater, electronics, fan, TV, etc, with one-touch control via your smart device or remote controllers. Smart Socket Adaptor: you can control power on/off, coordinated operation with other devices through grouping and preset on/off scheduling. The user can also check energy usage from the adaptor output. PIR Sensor: you can preset a rule to detect human motion to turn on the lighting or other smart devices to achieve greater energy and cost savings (for example – turning on the bathroom lighting and ventilation fan automatically when someone is inside). Magnetic On/Off Sensor: it works like a door or window sensor. It can also be installed inside a drawer or a cabinet to give an alarm when it is being tempered with. You can set a rule to turn on specific lights or an alarm device for security purpose. The INGENIUM® ZB is the ultimate smart control solution for stylish living at home, offices, retail stores, and other scalable spaces. Its ease of use, simple installation and scalability makes it perfect for an endless list of creative and Eco applications. Visit MEGAMAN® stand at the Hong Kong International Lighting Fair (Autumn Edition) from 27th to 30th October 2017, Hall 1, 1D-B02, we will showcase this intelligent application where visitors can control off/on, dimming, set timer, or set different scenes or moods at their fingertips by simply touching the app or Alexa voice. INGEMIUM® ZB app is now available for free download on both the Apple App Store and Google Play Store. MEGAMAN® is a global brand in high-performance, energy-efficient lighting and an innovative leader in LED lighting design, with technology targeting the best eco-lighting solutions. MEGAMAN® products are widely distributed throughout the world, including Europe, Asia Pacific, Middle East, Africa and South America, covering more than 90 countries. By setting environmental management as one of the company’s highest priorities, MEGAMAN® is focusing on eco-friendly environmental processes from initial design, to manufacturing, research and development, and the disposal and recycling of its products.